Connecticut’s Kaleena Mosqueda-Lewis is fouled during the first half of a game Wednesday, Jan. 28, 2015. UConn won, 87-32. Mike Pesca knows just how dominant Connecticut’s women’s basketball team has been this year. He lamented recently on Slate’s “Hang Up and Listen” podcast (around 49 minutes in) that every time he tuned in to a UConn game while working out at the gym this season, usually with 10 minutes left on the clock, the game was already effectively over. By just how much have the Huskies been draining the drama out of Pesca’s workouts? A lot, and by a whole lot more than their predecessors did. At halftime of the average UConn game this year, the Huskies were winning by 25 points. That’s staggering — so staggering that it blows away four of the best teams in recent history: the last four UConn teams, which all reached the Final Four. The last two won the title. Those two championship teams averaged halftime leads of a mere 20 points; the Huskies’ average halftime lead was even lower in the two years before that. 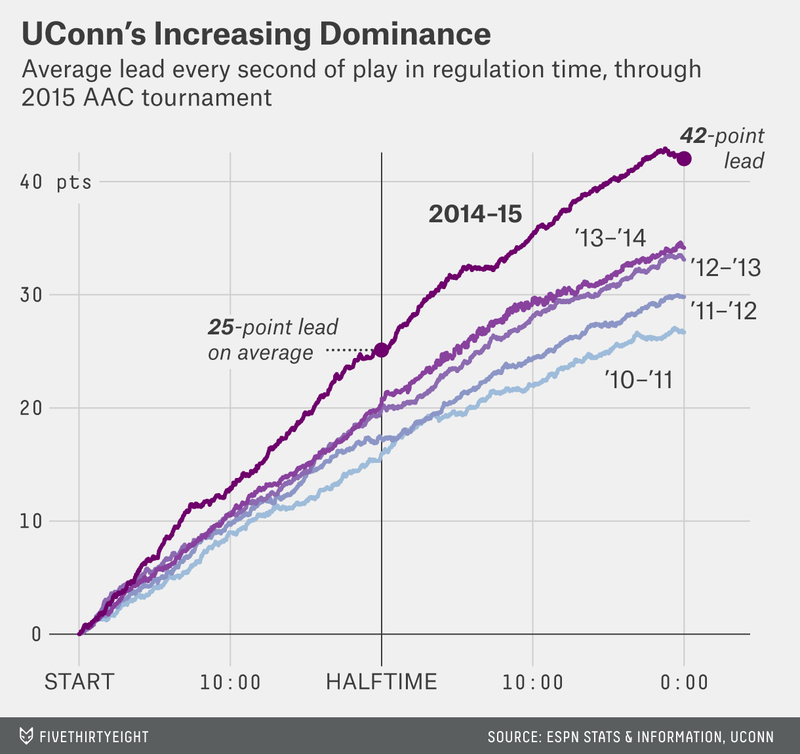 We also looked at the data another way: How often this season was UConn, say, trailing? Or winning by 40 points? The Huskies established dominance early: By six and a half minutes into their games this year, they were tied or trailing just once. And they led for the entire second half in most games, though Stanford tied things up in regulation and then dealt UConn its only loss, back in November. More than half the time, UConn led by at least 30 points two minutes into the second half. That all adds up to lots of minutes of Mike Pesca doing bicep curls with dull basketball on in the background. This doesn’t necessarily mean this year’s UConn team is the best UConn team of the last five years. The school shifted to the American Athletic Conference two seasons ago from the Big East, which has made for easier conference games and more blowouts. And the previous seasons’ stats include NCAA tournament games, some of which were close — though many were also blowouts. Even so, it’d take a whole lot of NCAA tournament drama to undo all the meaningless second halves the Huskies have played so far this year. Our forecast currently gives them a 74 percent chance of winning the title, before they’ve played their first game. That doesn’t leave much room for nail-biters.